A bespoke pair of sapphire stud earrings. A classic pair of stud earrings boasting rich blue sapphires. Chosen by the customer, the sapphires are round brilliant cut and have been four claw set by hand into the white gold setting. The open setting also allows for extra light to enter the sapphire and create more colourful sparkle. The neat claw setting helps to frame the sapphires too. The white gold metal compliments the dark blue sapphires beautifully. Equally, we think there are some other lovely combinations for a pair of stud earrings: rose gold and ruby, yellow gold and citrine, platinum and diamond, palladium and topaz. The choice is always yours here at Form Bespoke Jewellers. A redesigned sapphire and diamond bracelet. The customer came to see our recommended Yorkshire team to see if they could redesign a bracelet that she already owned. The round brilliant cut diamonds and sapphires were removed from the original bracelet and then reworked into a new bracelet chosen by the customer alongside our expert jewellers. The diamonds and sapphires have been claw set by hand in an alternating pattern into the white gold settings. The neat settings frame each stone beautifully whilst also allowing for a delicate movement in the bracelet too. The bracelet had an elegant white gold box fastening which is easy to use whilst also matching in with the neat, contemporary styling of the piece. We were so pleased with this bracelet and the customer was thrilled with their rejuvenated fine jewellery piece too. They even chose to return to us for the remodelling of their bespoke trilogy engagement ring! An elegant white gold cluster pendant with a bold blue sapphire and bright white diamond. This super sparkling pendant was designed by the customer alongside our expert Yorkshire jewellers. 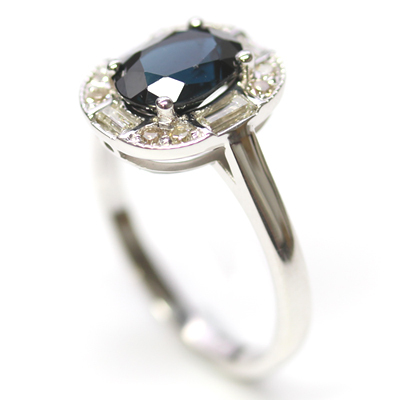 It showcases an oval cut, deep blue sapphire at its centre with a halo illusion of diamonds. In fact, there is a cluster of diamonds with a baguette diamond at the top and bottom of the sapphire and then 14 round brilliant cut diamonds surrounding them all. This creates a wonderful design detail and, of course, some extra sparkle! The collection of bespoke precious stones were set by hand in a white gold setting. The claw settings complement the traditional halo style and have been highly polished so they glisten in the light. The cool tones of the white metal, white diamonds and blue sapphire work beautifully together. The pendant sits on a delicate white gold chain which has been chosen to perfectly balance the proportions of the pendant. A bespoke yellow gold trilogy ring with a sapphire and diamonds. This bold and beautiful dress ring was created using stones provided by the customer. As a bespoke jewellers, this is one of our specialities. We can re-design your existing or inherited jewellery using the metal or stones to create something that is more in-keeping with your current style. 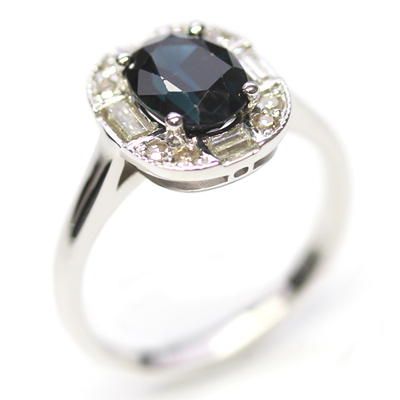 In this case, the customer’s cushion cut, black sapphire was set alongside their two, round brilliant cut diamonds to create a beautiful, trilogy, dress ring. The stones have been rub set by hand to ensure a tactile finish. The ring was cast in 18ct yellow gold. A stunning contrast to the bold black and white stones. 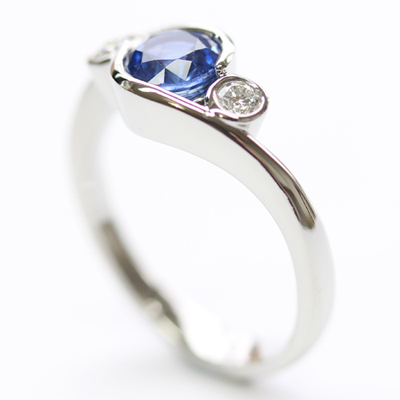 A beautiful trilogy dress ring showcasing a bold blue, oval cut sapphire and two bright white, heart cut diamonds. All these precious stones were hand selected by the customer. This is a special service that we are able to offer as a bespoke jewellers. Because we create your ring from scratch, you choose its components, from the design, to the precious metal, to the perfect precious stone/s. The sapphire and the diamonds are claw set by hand for a neat and traditional finish. They are framed too by open shoulders which add a pretty design feature to the trilogy setting. The ring is also cast in a platinum. A complementing choice to the cool tones of the sapphire and diamonds. A bespoke and colourful, trilogy dress ring. 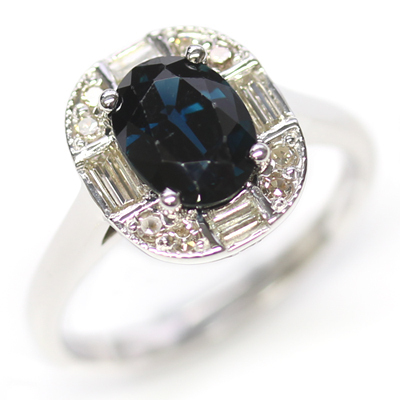 A bespoke Art Deco inspired dress ring with a sapphire and diamonds. A deep blue, oval cut sapphire sits at the centre of this halo dress ring. Surrounding it are a selection of baguette cut diamonds and round brilliant cut diamonds which have been set beautifully to create an Art Deco styling. The long baguettes form a neat cross shape and two round diamonds on each corner follow the elegant curve of the oval sapphire. The round brilliant cut diamonds have been grain set by hand to create an extra sparkling illusion. The baguette cut diamonds have been flush set by hand for a neat, tactile finish. 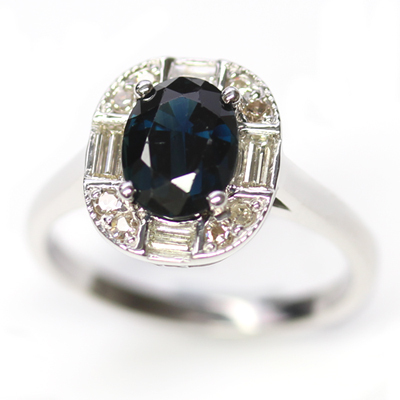 The centre oval cut sapphire has been four claw set by hand to follow a classic setting style. The customer chose for their Art Deco inspired dress ring to be cast in white gold to compliment the stones and their other jewellery. A bespoke platinum dress ring with a bold sapphire and pretty diamonds. This beautiful dress ring was designed as a colourful treat for the customer’s wife. After looking at a selection of our previous trilogy commissions, the customer brought together details from different rings to form this bespoke wave design. His design was then recreated on CAD so that he could see his ideas brought to life as 3D virtual images. On his approval, the images were send to the casters for the dress ring to be cast in platinum. The customer chose platinum to match his wife’s other jewellery. 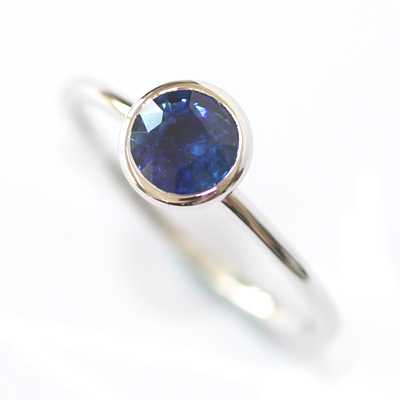 At the centre of the ring is a bright blue round brilliant cut sapphire. Flanking this are two smaller round brilliant cut diamonds. The wave design allows the diamonds and sapphire to be almost fully rub set which provides a lovely, tactile finish. We think the flow of the metal around the precious stones is simply stunning. A beautiful white gold dress ring with sapphires and diamonds. This bespoke dress ring is a wonderful example of how CAD can help bring a customer’s design life. The customer visited our Chapel Allerton studio with an image of a ring they had found online. They were inspired by the elegant swirl details but wanted to create their own bespoke interpretation of the design. Alongside the guidance of our expert Yorkshire jewellers, they decided on a fluid and tactile design with rub set round brilliant cut diamonds and cool blue sapphires. Their design was then translated onto our CAD software to produce a 3D virtual image of the final dress ring. Once the customer had approved the design, the rendered image file was sent to our casters to be cast in 18ct white gold and on it’s return to us the diamonds and sapphires were hand set into the rub settings. This beautiful white gold dress ring was also finished and polished in our Chapel Allerton workshop. A bespoke solitaire eternity ring with a rub set sapphire. This is a lovely twist on the classic eternity ring style. Often we see customers choosing a fully diamond or coloured stone set band ring. In this case, the customer chose a bold solitaire design. At the centre is a rich blue, round brilliant cut sapphire. It is framed beautifully in a rub setting and sits upon a slim band for maximum impact. The white gold metal complements the stone perfectly and really brings out the blue. 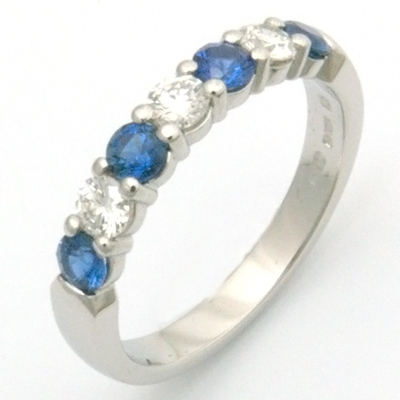 A bold and beautiful, sapphire eternity ring. A bespoke platinum twist eternity ring with sapphires and diamonds. This beautiful eternity ring has the illusion of two intertwined bands. As the twisting design moves down the shoulders, it blends seamlessly into a slimmer, singular band at the bottom which ensures a comfortable fit. Hand set into one of the “bands” are matching, petite, round brilliant cut diamonds. Then, to contrast, blue sapphires have been set into the other. All the stones are grain set for extra sparkle too. The customer chose for their eternity ring to be cast in platinum to match their existing jewellery. The result is a beautiful and colourful, twist eternity ring. 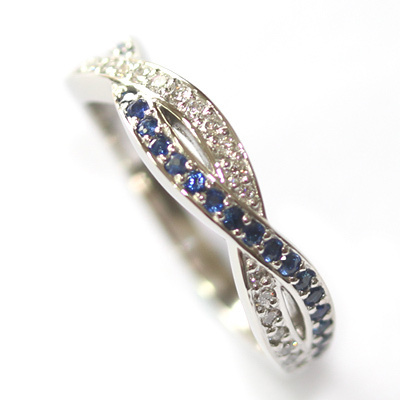 A bespoke 18ct white gold eternity ring with an infinity symbol of sapphires. 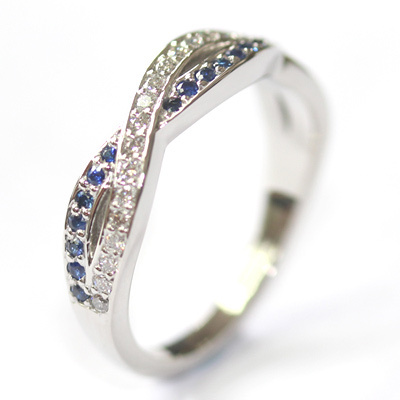 The customers came to us with a clear idea of the design they wanted; an infinity eternity ring with sapphires. Alongside the guidance of our expert Yorkshire jeweller, their design was brought to life using CAD software. Here, Gary was able to create a 3D virtual image of their eternity ring for them to view and approve. Once the customers were happy, their design was sent to the casters to be cast in 18ct white gold. Then, on it’s return to us, the ring was hand finished and set with 30 deep blue sapphires. All the stones have been grain set and the metal highly polished to give the ring an extra sparkling illusion. The customers were thrilled with their bespoke, colourful eternity ring. A pretty pink sapphire and diamond eternity ring. 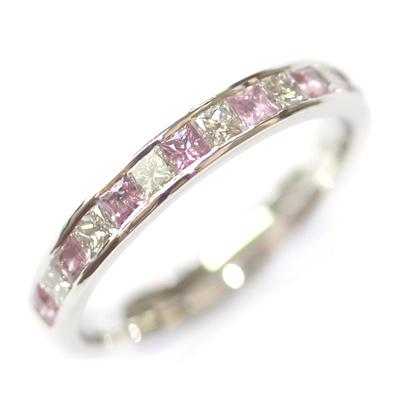 This colourful eternity ring boasts beautiful, alternating diamonds and pink sapphires. A very pretty combination! All the stones are princess cut and channel set. This means that they sit neatly within the band and ensures a tactile finish across the ring. The ring is also cast in platinum which we think is a clever design choice. The white metal beautifully complements the cool pink and white stones whilst also being the most durable of the precious metals. 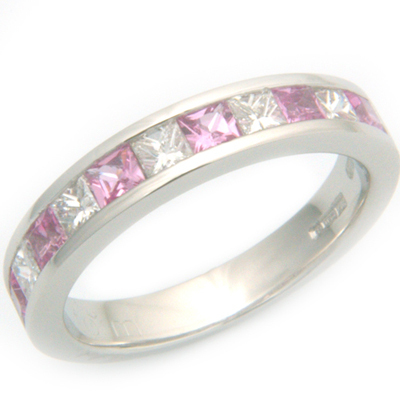 A pretty pink eternity ring. A palladium eternity ring with sapphires and diamonds. The customer chose a palladium band for this eternity ring to coordinate with their existing jewellery. They decided on three round brilliant cut sapphires with one slightly larger than the others to have in the middle. Our expert jewellers at Form Bespoke Jewellers sourced a selection of sapphires for the customer to choose from, of which these three complimented each other best. The customer also chose to have four round brilliant cut diamonds set in between the sapphires. All the stones were grain set to give an illusion of extra sparkle. 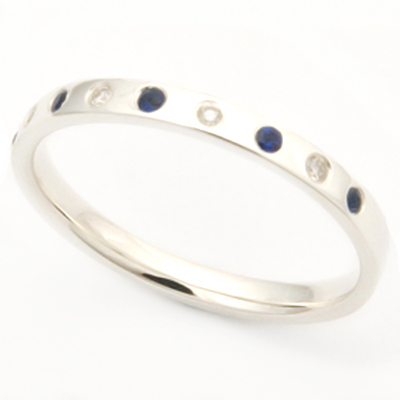 An eternity ring showcasing beautiful sapphires and diamonds. The customer returned to Form Bespoke Jewellers looking for a classic eternity ring with a colourful twist. They had previously bought their 18ct White Gold Princess Cut Diamond Halo Engagement Ring from us. Firstly they chose an 18 carat white gold flat court band. A flat court band has a contemporary style with a flat surface across the top and a comfort fit on the inside. White gold was chosen for the ring as it complements their engagement ring and also the cool tones of the sapphires and diamonds. All the diamonds and sapphires are round brilliant cut and were rub set in an alternating pattern. Rub setting the stones leaves the ring with a smooth tactile finish. The customer also chose for only the top half of the band to be hand set ensuring comfort again. Our expert jewellers hand set, finished and polished the ring in our Yorkshire workshop. A bespoke sapphire and diamond scatter pave eternity ring. This couple were looking to create a totally unique eternity ring using different shades and sizes of blue sapphires. Our expert team at Form Bespoke Jewellers sourced a selection of deep blue through to pale, almost indigo coloured, round brilliant cut sapphires for this bespoke design. They ranged in size from 1.25 mm to 2.3 mm. The customer decided to add white round brilliant cut diamonds set in between the sapphires. The cool and contrasting colours of these stones look simply stunning together. Both the sapphires and the diamonds were pave set by hand to create an extra sparkling illusion. Pave setting is when the stones are set very close together and the metal which hold them in place is highly polished. The customer chose an 18 carat white gold, 4 mm, flat court profile band for their eternity ring. The ring was hand finished by the team in Leeds. Making it ever-colourful with a diamond and pink sapphire eternity ring. Form Bespoke Jewellers created this stunning channel set eternity ring in platinum for the customer. The ring was handmade to sit perfectly in proportion with the profiles of the wedding and engagement rings. The customer looked at all diamond and full set versions before deciding on alternately set princess cut diamonds and pink sapphires. The ring weights over 5.3grams in platinum and is set with 5 x 2.5mm princess cut diamonds with a total diamond weight of 0.50ct and 6 x 2.5mm pink sapphires. Sapphires are naturally available in a wide range of colours including red, yellow, green and brown as well as the more commonly recognised blue. Pink sapphires have grown in popularity and the recent find of fantastic quality and quantity in Southern Madagascar made them more affordable. Pink sapphires are available from pale baby pink to an intense magenta pink, and like all precious stones the price varies depending on clarity. This customer was looking to create an eternity ring using coloured precious stones. We created this beautiful seven stone design to compliment her engagement and wedding rings which were cast in platinum. We then arranged for a selection of sapphires and diamonds to be brought in for the customer to view and they chose to go with 3mm Ceylon sapphires which have a lovely ‘cornflower’ blue colour and 3 x 3mm round brilliant cut diamonds of G colour and SI clarity with a combined diamond weight of 0.31ct. The precious stones are set alternately into the platinum band and the effect is stunning. A diamond and sapphire eternity ring that has been pavé set in 18ct white gold. The combination of Ceylon sapphires (which are a crisp strong blue colour) and G colour VS diamonds work beautifully. Set into our exclusively designed half ‘Glacier’ ring from the Form Bespoke Jewellers Eternal Range. Using a pavé style setting gives a wonderful flash of diamonds and colour using as little metal as possible. The polished grains also allow for an extra sparkling illusion. This ring really does have a wow factor! This eternity ring has been cast in 18 carat white gold. However, Form Bespoke Jewellers are just as our name suggests…bespoke jewellers! You could choose to have a similar design cast in platinum, yellow gold or rose gold. The choice is yours. We can create almost any design. Also, virtually any combination of stones could be set. We think with the cool tone of the white metal, bright diamonds and pale blue sapphires looks simply stunning. With yellow gold, rubies would look good. With rose gold, try smokey quartz and diamonds.